Officially, I bought this for my wife to give to me as an early Valentine's Day gift. 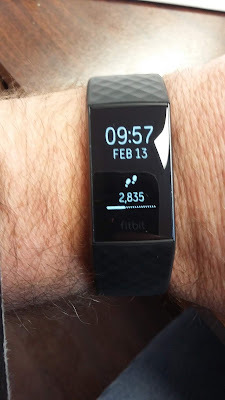 I finally pulled the trigger on the purchase because I recently got new health insurance and that insurance has a fitness incentive program that pays me $20 (direct deposited in my checking account) anytime I complete 10,000 or more steps at least 12 times in a month. I do have an app on my phone that counts my steps too. But, I just don't have my phone on me 24/7 and I know I'm not getting credit for a good chunk of steps I take at home or at the office. Heck, just this morning, I had close to a 1000 steps in just from my normal morning activity of helping get the girls ready for school. So far, it seems to be working OK. I'm still trying to figure everything out because this pretty much came with no instructions (I'm sure I can find them online, but I just haven't gone through the effort yet). However, it seems to be doing a good job keeping track of my movements and I even had it tell me I needed to take a 2 minute break this morning, though I'm not sure if that part was something that is automatic (triggered by me shoveling snow this morning) or I accidentally bumped something. My only real concern about it is whether or not it will prove to be sweat proof. It's not a big deal now. But, come spring/summer, when I'm doing yard work, I'm sure I'll be putting it to the test. After all, I've lost count of how many watches I've destroyed because of that.